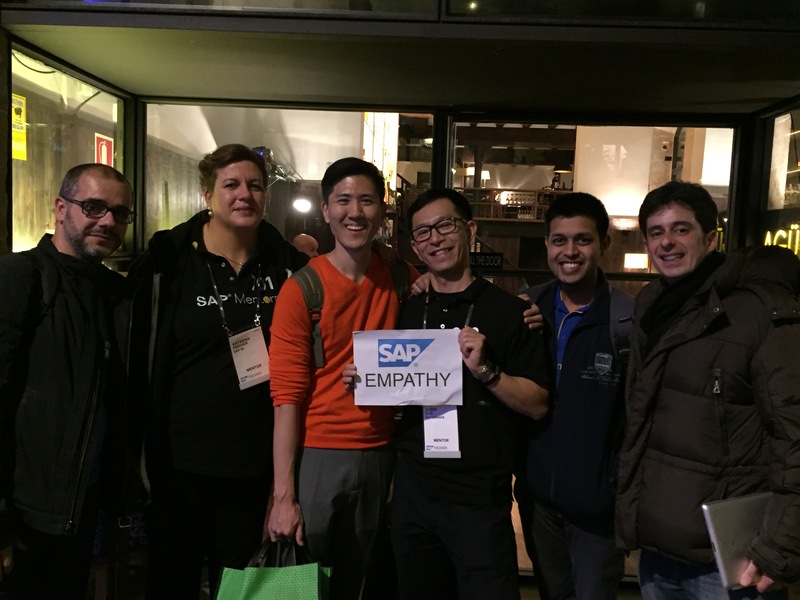 Well, it’s confirmed (again) – the SAP community truly cares about empathy! On Nov 10th in Barcelona, the “Evening of Empathy” event welcomed a packed house of SAP customers, partners and colleagues eager to learn more about how empathy matters. A great big thanks goes out to SAP Mentor and empathy coach, Seung Chan Lim (Slim), who led participants through a series of workshop exercises designed to take us out of our comfort zones, and to challenge our own biases. Everyone can empathize – it may take some effort and the expert guidance of a coach to help, but we have this ability in all of us. To realize empathy, we must take action – the very first action is to use our imagination. By imagining ourselves in the shoes of our counterpart, we gain insights that come from this different perspective. To realize empathy’s true value, we must take action on those insights. We need to use this knowledge to improve our personal and professional relationships in order to see the full potential of empathy. What actions can we take with these lists of impediments and catalysts? What is the relevance to organizations like SAP? As a start, being more empathic to cultural differences of customers means organizations need to take more time and effort to understand the practices and norms of customers in other regions, especially for marketing campaigns and even product design. Active listening programs with customers and end users should be a forethought instead of an afterthought for organizations who care about improving the buying and usage experience of their customers. Instead of me going on, I’d rather hear from you. Are there any impediments and catalysts for empathy you would add? What actions can organizations take with this knowledge to improve their customers’ end to end experience? The empathy conversation continues. Stay tuned for a series of SAP Community Calls focused on less-technical topics such as empathy, Business Beyond Bias, and design thinking. Forget about position titles, project politics, personal agendas. Remember every member is around you is a person. They have their own challenges, stresses and conflicts that they carry with them each day. For some it’s a burden that overflows into their professional life and they need that support and understanding. You take those few minutes out each day to connect with a person and check they are okay and you reap the rewards. Eventually, their burdens reduce and the support they receive during challenging times is shown in how much they also care. But ultimately, you have to do it because you genuinely care about a person. Not because someone told you empathy is an important quality and there are business benefits. Those who treat caring about someone as a checklist are transparent – they lose respect. And as I ramble on, the back up options – if you can empathise, then at least sympathise. You may not understand through experience what someone’s challenges are (Be it a colleague, a customer or supplier) but if you at least listen (yes, actively) you might just be able to imagine. And that imagination may just be enough to be able to help. As far as impediments goes – like anything – apathy is the worse. Then if you add budget/financial implications – some peopel find it hard to empathise as they fear it is interpreted as agreements/committment. Then it can turn into a debate as to who pays. It’s the sign of good people who have given up and don’t have the energy to care or fight anymore. Amibition can be both an impeidment and a catalyst. Thank you Colleen for adding these significant impediments and catalysts to empathy! It does come down to our basic human obligations to care about those around us. You also make a great point – empathizing does not mean agreement – the goal and outcome of empathy is understand the value, beliefs and actions of others. I enjoyed a lot the empathy session with Seung Chan Lim (Slim) and all SAP Mentors community. where we can find SAP at 10th position.